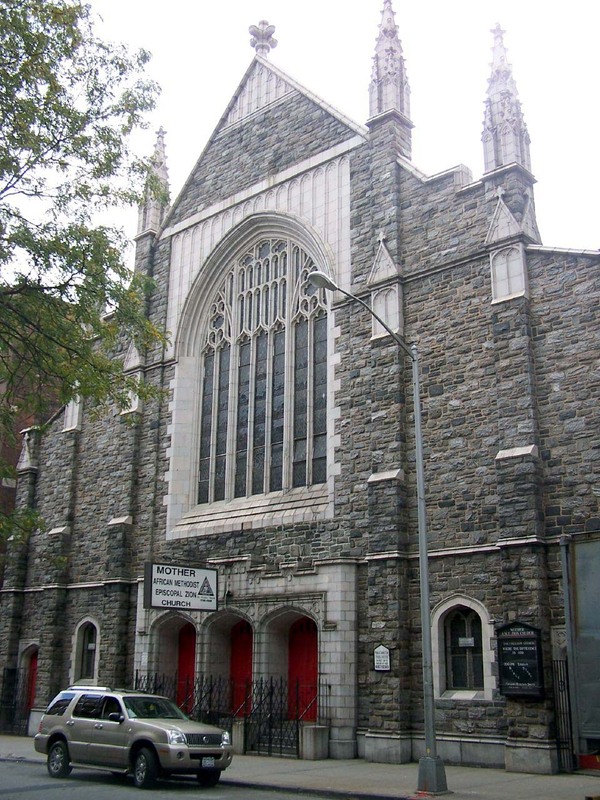 The African Methodist Episcopal Zion Church is an historically African American Protestant denomination based in New York City, New York. Also known as the Freedom Church, the AMEZ was officially recognized in 1821, but the foundations for Zion’s founding began in the late 1700s. In 1796, due to frequent acts of discrimination and segregation in white Methodist churches, many black parishioners left to form separate ministries. This exodus led to the creation of the AME Zion denomination which started as an informal meeting of multiple black-founded churches from various cities. The first church collectively run by the AMEZ, simply named Zion, was built in New York in 1800. In 1820, after failing to maintain amiable connections to the predominantly white John Methodist Church, also based in New York, six of the African-American churches gathered for their annual conference to determine the future of the AMEZ. Among the church leaders was James Varick, a preacher who had been present since before the church’s founding and had encouraged the initial separation in 1796. At the 1820 summit, Varick was ordained as a church elder. In 1821, Varick became the AMEZ’s first bishop. Between 1820 and 1860, the AMEZ grew to nearly 200,000 members spread across most Northern states. These numbers swelled during the Civil War as freedom came to the enslaved people of the ex-Confederate states which allowed them to establish AMEZ branches across the South. Also, Northern AMEZ ministers and others traveled South following the war to actively help the newly freedpeople. By the beginning of the 20th Century, the AMEZ church had become a leading African American church denomination, second only to the African Methodist Episcopal (AME) churches. AMEZ, however challenged the standard protocols of both white and black denominations at the time. For example, they were one of the first denominations to ordain women as ministers. They also promoted women, putting them in positions of authority within the Church. By the 1950s and 1960s AMEZ church member contributed significantly to the Civil Rights Movement. Many of them joined peaceful protests and marches throughout the nation while church leaders opened their doors to allow civil rights planning meeting and rallies. Today, the AMEZ Church’s mission continues to promote both the spiritual and socioeconomic uplifting of all people of African descent. The AMEZ Church claims over 1.4 million members in churches throughout the United States and has missionaries all over the world. It also has churches in west and southern Africa. As of 2012, the AMEZ Church entered a pact with other Methodist churches to transcend racial boundaries and encourage church unity. The Church currently runs six institutions of seminary learning, four on the East Coast of the United States and two in West Africa. It also sponsors scholarships for black students worldwide. Ebony Editors, Ebony: Pictorial History of Black America Vol. I: African Past to Civil War (Nashville: Southwestern Company, 1971); Mabel E. Smythe, The Black American Reference Book (Englewood, New Jersey: Prentice-Hall, Inc., 1976); The Official African Methodist Episcopal Zion Church website, http://amez.org/.